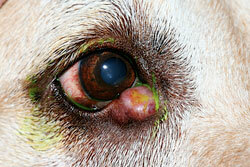 Eyelid masses are most often benign in the dog. Cats have a higher incidence of malignant eyelid masses.. Depending on the size, location and appearance of the mass your doctor may recommend taking a sample of the mass (biopsy or fine needle aspirate) to determine the mass type prior to definitive surgery. If the eyelid mass involves less than about one third of the eyelid margin, removal can be performed in a routine fashion. Small masses with minimal involvement of the eyelid margin can often be removed by CO2 laser photoablation under local anesthetic to avoid the need for surgical removal under general anesthesia. If the mass involves more than one third of the eyelid margin, surgical reconstruction of the eyelid is usually necessary. This may require more complicated procedures, and sometimes more than one surgery will be needed to fully reconstruct the eyelid. Even benign eyelid masses can lead to corneal irritation and ulcers, eye and eyelid infections, corneal scarring, corneal vascularization, and corneal mineralization. Some of these complications can be painful and cause vision loss. Any surgical procedure can introduce complications, including potential anesthetic risks. Surgical procedures that involve the eyelid or skin surrounding the eye rarely give rise to complications, which occur in less than two percent of these cases and are usually minor. Potential complications include, but are not limited to, inflammation of the eyelid (blepharitis); inflammation of the pink tissue surrounding the eye (conjunctivitis); break down of the tissue or suture at the surgical site (wound dehiscence); infections at the surgical site, which may extend to other areas of the eye; corneal ulcerations; corneal scarring, vascularization, or mineralization; and tearing (epiphora);. Close post-operative monitoring and adherence to medication and recheck schedules can minimize complications. Any disconcerting signs should be reported to your doctor immediately to allow any complications to be identified and treated promptly, reducing risk of progression vision threatening complications.